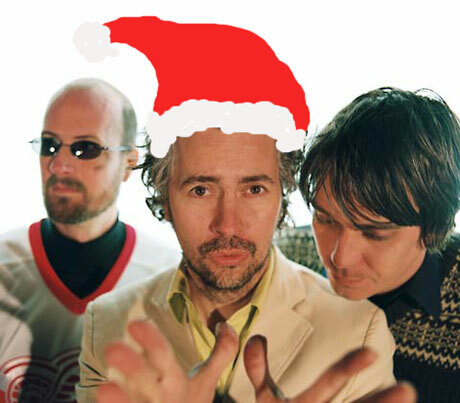 Whether it be on Earth or Mars, it's no secret the Flaming Lips love them some Christmas. In fact, they love the holiday so much that this year head Lip Wayne Coyne gave the folks over at Spinner 12 reasons why Christmas is indeed awesome. And unless your heart is truly a lump of coal, you'll see that Coyne has some damn good points on why this day should be a magical one, not to mention more than a little heart-warming. So pour yourself some nog, double the shots and let ol' Wayner remind you just why Christmas rules. Smiling triggers a release of endorphins. Smiling is contagious. And smiling almost always makes your face look better. Christmas makes you smile! Santa! Elves! Reindeer! Trees! Snow! Presents! Mistletoe! Music! Lights! Food! Parties! Who needs religion?! Christmas shows that generosity and sympathy for suffering are reasons to believe in humans, not gods. We forget how lucky we are to live in a world where almost anything we want to eat at any time - regardless of how exotic - is available. Christmas gives us an opportunity see once again how simple and pleasurable human existence can be. Remember "food made with care always has the flavor of love." Didn't Padma Lakshmi say that? There is a way of perceiving the world that shows us there is magic all around us, but it is up to us to see it. Christmas reminds us that childlike wonder doesn't have to be just for children. There are many clichés and jokes about dreading the uncomfortable family holiday. But at the root of this demand that "families be together" is the commitment of a firm foundation and a stable life. We can easily see within the drama of struggling families how the real meaning of tolerance and forgiveness need to be embraced and understood. Christmas encourages families to see the good in our situations. One of the many messages that can be discovered when analyzing the meaning of Christmas is a constant plea for peace on Earth! So it's simple - Christmas is anti-war. When I was 6 years old, my older brothers told me that Santa Claus was not real. I said, "What do you mean he's not real? I see him everywhere I go." And they replied, "That's just your dad or some guy at the store dressing up like him." For a brief moment I despaired, but I quickly recovered and thought, "If there is no real Santa, then maybe we could all be Santa. That way we don't really have to wait for him to drive all the way down from the North Pole. We'll just be him right now." And so maybe Santa himself is not real, but we can easily make the idea of Santa real. We have sympathy for those humans that are suffering. We also have sympathy for all the creatures of the world that might be suffering. There is a mechanism within the human mind that allows us to have a psychic "oneness" with the people and animals around us. If we are lucky, they are happy and healthy and in turn make us, in a psychic sense, happier and healthier. But when we are around those who are suffering, we have a psychic suffering as well. So we want to relieve their suffering because it relieves our suffering. We get to look at colored lights in the darkness of winter. It is a great coincidence that as our days - in the Northern Hemisphere, anyway - get shorter we battle back with artificial light. And so, as we all cooperate by adding our own little light into this cold, dark world, we transform this bleak void into a place of hope and wonder. To be hopeful and to be happy - these are strange, silent sensations that seem to happen only in our minds. But as Christmastime proves, it is a contagious way of being. To show each other that we believe in each other is an energizing event. To be in the company of other humans who are being optimistic and enthusiastic is like a form of real magic! Anything is possible! Christmas celebrations encompass all the wonders of our natural world. It is full of animals, trees and even weather. So even if there are not humans in our life to give love to, we can always give love to animals, give love to trees and plants, and we can always have experiences that illuminate the grandeur of existence by simply realizing how helpless we are to the patterns of our planet. It shows us and proves to us the power of giving love. We sometimes think it's about giving gifts, but what the gift represents is love. And so, to some, it's awkward and maybe for some it is even embarrassing, but you see, it's the giver who is actually getting the greatest gift. So we set aside this day to have this powerful interaction with the people around us. If we did not get to do it once a year, our world, as we would eventually see, would not have experiences with "giving love" and the human race would slowly evolve back to its medieval nature. Flaming Lips "Christmas at the Zoo"